Hi there, hope you had a great weekend! Are you ready for Valentine's Day? 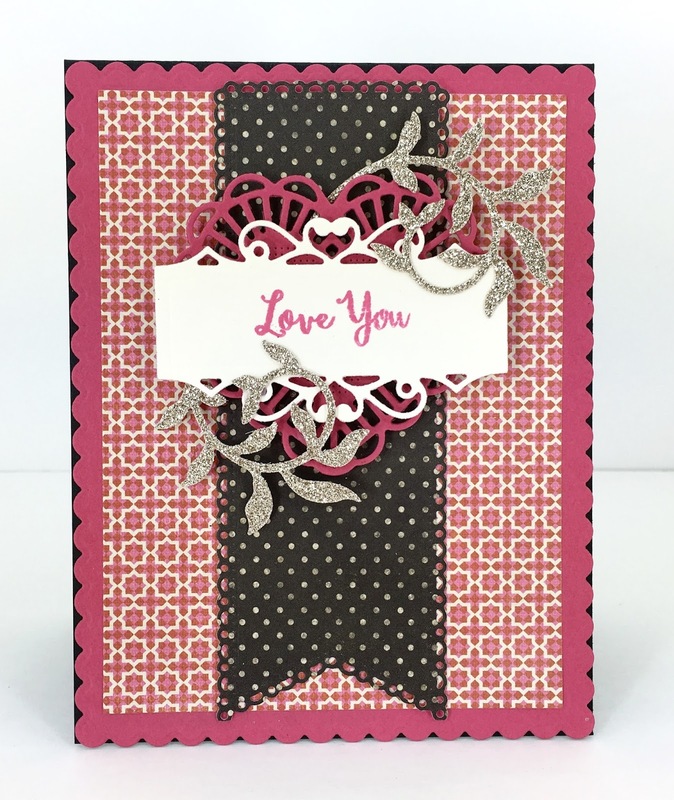 Well, if not, I have a card to share with you using Cheery Lynn Designs gorgeous dies. So let me show you how I created this card. 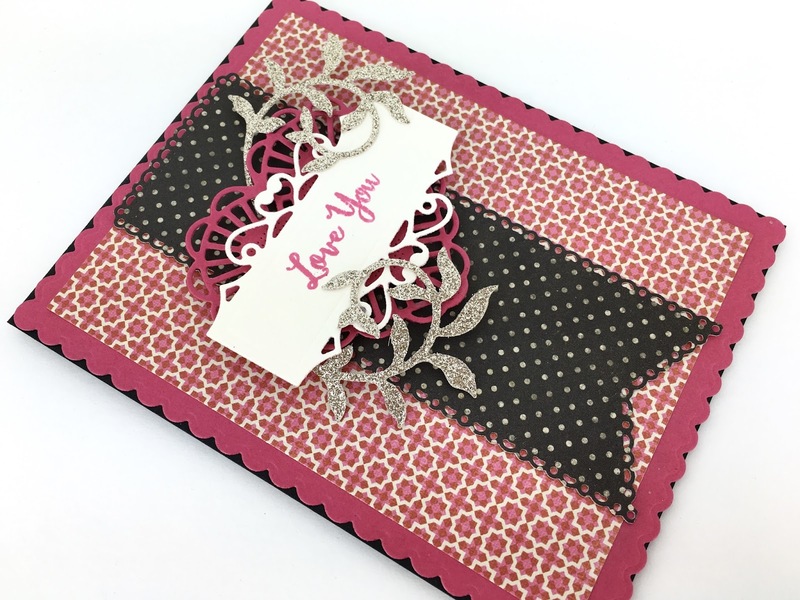 I started out by creating an A2 size card base out of black card stock, than I die cut a A2 Frames Rectangular Scalloped die out of pink card stock and adhered it to my card base. Next I die cut a A2 Frames Rectangular Classic die using patterned paper and adhered that on top of my pink scalloped die cut. Than I die cut a Horizon Fishtail Banners out of another patterned paper and placed that in the middle. Than I die cut the bigger of the Two Of Hearts die out of the pink card stock and placed it on top of the banner. Next I die cut one of the Tags #1 dies using cream card stock and stamped my sentiment on it which is by Justrite Papercraft called Doodled Roses and added it on top of the heart. Finally I die cut two Leafy Flourish dies using the smaller design using gold glitter card stock and tucked it under and over the sentiment tag. Well, that is it for now. 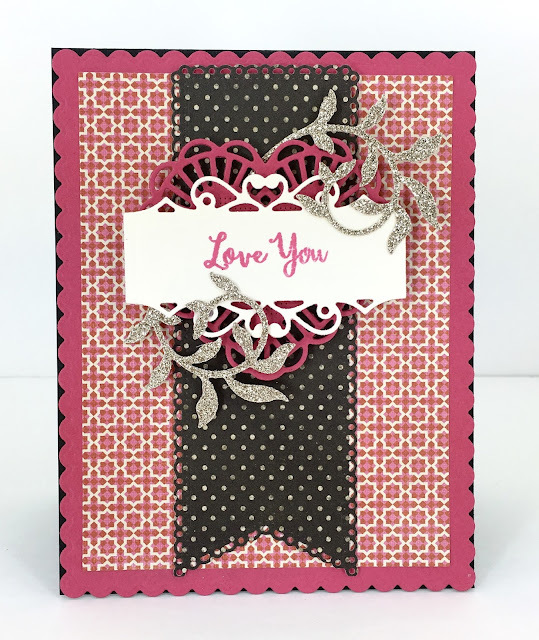 Thank you for stopping by and hope to see you cards playing in this week's challenge at Cheery Lynn Designs!